Four in the Morning are an alternative-folk band based in Melbourne, Australia. 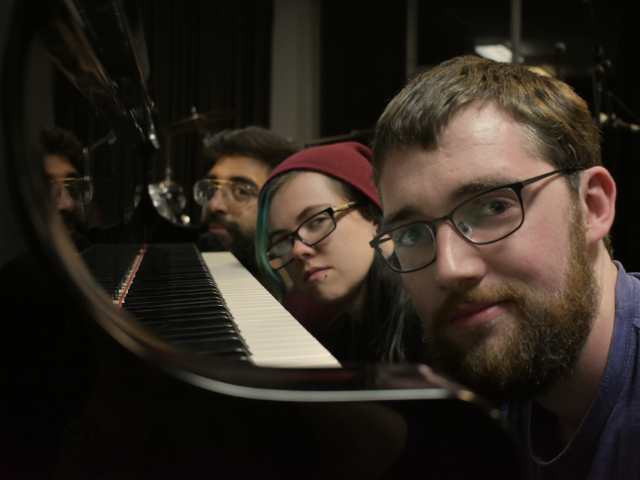 The band consists of DCU Communications Studies graduate Kevin Dolan, and his band members, Kiran Srinivasan and Libby Ferris. We spoke to Kevin (lyricist and vocalist) about the band and their EP, “Half Asleep”, which was released last November. It’s actually inspired by the poet Rives, who did a TED Talk recently where he noticed that four in the morning is the time most mentioned time in songs. He referenced it as the “grown-up hour”, a reflective time when you’re either up too late or awake too early. It was going to be some obscure Simpsons reference like, “Sincerely, Little Girl” or “General Krull” – but we decided against it. When I first moved here, I didn’t know anyone and a great way to meet people was to play music at the open mics. I first saw Libby at one where she played guitar for the other band she’s in and I knew I needed her in my own band. We essentially found Kiran off the street when we went out looking for a drummer. Honestly, I’m more of a Yeats man but I do love Kavanagh, he manages to create something beautiful and sad from the mundane. I’m also really into Bob Dylan and Bruce Springsteen as well as The National. Kiran, who plays jazz drums, is interested in more alternative stuff, like Talking Heads. Libby, on the other hand, loves atmospheric rock. We all have really different interests and it shows in our music, it’s such a nice mixture. Kiran and Libby take my folksy songs and make them a lot weirder. This entire album was self-recorded, what was that like? It had its pluses and minuses. I did radio while I was in DCU and I really enjoy the editing and tinkering with sound. Recording it ourselves granted us the time and flexibility instead of renting out a studio for a day or so. Your songs explore turbulent relationships and religion. Where do these ideas come from? Not to sound cheesy, but it’s stuff that keeps me up at night. When I’m having trouble sleeping, I write songs to get the thoughts out of my head. A lot of the times, a line just comes to me right before I go to sleep or when I’m out for a walk and I work from there. What’s the music making process like? We usually write during our jam sessions. I’ll start with a loose chord progression and then Libby and Kiran take it from there and make it more interesting. Sometimes we’ll be playing and we’ll stumble on a melody we like, record it and then I’ll write lyrics to it. Where can people listen to your EP, “Half Asleep”? You can listen to it anywhere really, Spotify, Soundcloud, iTunes. I think we’re even on TIDAL. Maybe Jay-Z listens to us.